AstraZeneca’s immunotherapy combination including its checkpoint inhibitor drug Imfinzi has failed to improve overall survival in a first-line lung cancer trial – an indication where Merck & Co is enjoying huge sales success with Keytruda. However the results of the phase III MYSTIC trial were not a huge surprise, as the combination of Imfinzi (durvalumab), a PD-L1 checkpoint inhibitor, and tremelimumab, an anti-CTLA4 antibody had already failed against a progression-free survival endpoint last year. AstraZeneca had been waiting to see if the drug could improve overall survival and while the trial has been a failure overall, the company said it will investigate whether the drug works in certain groups of patients. The trial compared the Imfinzi and tremelimumab combination in previously untreated patients with stage IV metastatic non-small cell lung cancer (NSCLC). In the primary analysis population of patients, whose tumours express PD-L1 on 25% or more of their cancer cells, Imfinzi monotherapy and the combination of Imfinzi plus tremelimumab did not meet the primary endpoints of improving OS compared to standard chemotherapy. But Imfinzi monotherapy did produce a 24% reduction in likelihood of death, compared with chemotherapy, and AZ said the data supports further analysis in subgroups. The safety and tolerability profiles for Imfinzi and the Imfinzi plus tremelimumab combination were consistent with previous trials. 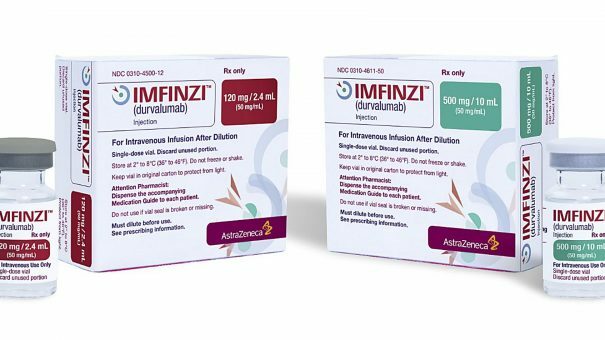 Dr Sean Bohen, AZ’s chief medical officer, said: “We are encouraged to see that Imfinzi monotherapy activity is in-line with that of the anti-PD-1 class in previously-untreated patients with Stage IV non-small cell lung cancer; however, we are disappointed that these results missed statistical significance. With this result AZ has missed out on an opportunity to compete in a lucrative indication where Merck’s Keytruda (pembrolizumab), either with or without chemotherapy, has become standard care. Imfinzi has proved itself in other niche indications and is approved for unresectable stage 3 NSCLC in more than 40 countries, including the US, EU and Japan, based on the phase III PACIFIC trial. In the US it is also approved in previously treated patients with advanced bladder cancer.